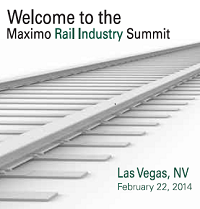 Maximo Rail Industry Summit Enters its Fourth Year! The 4th annual Maximo Rail Industry Summit (MRIS), the premier event for Maximo users in railroad, railway and rail-related transportation organizations, will take place Feb 22, adjacent to the IBM Pulse event. Panel discussion of EAM, GIS and Spatial – are all of these required to implement the complete picture of EAM? With significant transportation industry expertise, coupled with AAA accreditation and a dedication to Maximo, Interloc shares Bill’s vision for the Summit and continues to be a primary partner in its realization, providing sponsorship, event management and logistics support.